Background: Aggression in adolescence is a key point of focus for psychologists, educationists, parents, and teachers. On the other hand, interdisciplinary researches with special reference to yoga and psychology are growing rapidly in this era of applied science. Despite rapidly growing scientific literature on yoga and its application, there has been no study conducted to determine whether Kapālabhāti (a yogic practice) affects the aggression level in adolescents. Aims: The current study aimed at exploring the effect of Kapālabhāti on the aggression level of adolescents. Methods: A sample consisting of 40 intermediate and undergraduate students from Gayatri Vidyapeeth and Dev Sanskriti Vishwavidyalaya, Haridwar, Uttarakhand, respectively, was taken. The entire sample belonged to the age group of 15-20 years. Kapālabhāti practice was given to each and every subject of the group for a period of 30 days regularly. In this research, pre-post single-group design has been applied. Participants were given a questionnaire named as "aggression scale" (A-scale) which was developed by Pal and Naqvi (1983) for measurement of aggression score. Statistical Analysis Used: Paired sample t-test and eta-squared statistics have been used for comparing pre- and post-mean scores and computing the magnitude of the effect of intervention, respectively. Results: There was a statistically significant decrease in the aggression score from pre-test (M = 63.85, SD = 21.75) to post-test (M = 49.95, SD = 14.53), t (39) = 8.42, P < 0.01 (two-tailed). The mean decrease in aggression score was 13.9 with a 99% confidence interval. The eta-squared statistics was 0.64, which indicates large effect of the intervention on aggression. Conclusions: The findings revealed that the practice of Kapālabhāti is highly effective in reducing the aggression level in participants, which was significant at 0.01 level of significance. We can see the odious behavior of aggression in all types of individuals; but today, it has become a significant clinical and social problem among adolescents. Adolescent aggression is an important point of focus for educators and parents, owing to its relative stability over time and consistent link to a variety of negative outcomes later in adolescence, including delinquency, substance use, conduct problems, poor adjustment, and academic difficulties like poor grades, suspension, expulsion, and dropping out of school (Sharma, 2012). Later, these signs of aggression lead to the symptoms of many psychiatric disorders. These include Oppositional Defiant Disorder and Conduct Disorder, both of which have prevalence rates ranging from 6 to 10% in the general population and even higher among males, according to the American Psychiatric Association. Aggression is defined as "a sequence of behavior, the goal response of which is the injury to the person toward whom it is directed" (Dollard, Doob, Miller, Mowrer, & Sears, 1939). In psychology, the term aggression refers to a range of behaviors that can result in both physical and psychological harm to oneself, others, or objects in the environment. The expression of aggression can occur in a number of ways, including verbally, mentally, and physically (Berkowitz, 1993). For young children to overcome their aggressive behavior problem, they need positive, pleasant, and nourishing environment. Recently, a new term "Helicopter Parenting" has emerged for those parents who keep a watch on their children all the time and research suggests that this type of parenting style is not good for consistent and healthy child development. It leads to aggressive behavior because of frustration at childhood stage or during adolescence. So, it is the responsibility of parents and teachers to create positive surroundings and tackle their children intellectually and carefully. Medical treatment has many side effects. Individuals get addicted to the medicines. There are more chances of relapse if one stops taking the medicine and is totally dependent on it (Sharma, 2012). One of the authors of this research report has experience in the field of mental health. Many patients complain about the side effects of psychiatric drugs and face difficulty of withdrawal. Ultimately, they have an urge to take alternative treatments like yoga, psychotherapy, etc. There are many types of yogic practices like āsana, prān̟āyāma, mudrā etc. in yoga, which can reduce the psychological problem of any individual. Techniques like yoga, relaxation, and interpersonal counseling also seem to be highly influential in reducing aggression (Rana, 2007). Rao (1995) discusses the significance of yoga to the well-being of mankind. The core of yoga practice lies in concentration, yogic meditation, and absorption. Reports show that yogic practices are probably the most important and effective self-help tools available to humanity. Collins (1998) suggested that regular practice of yoga leads to overall physical and psychological well-being. 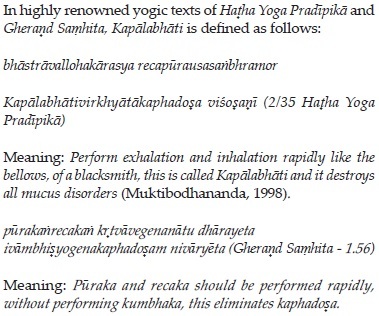 Kapālabhāti is one of the six cleansing methods (s̟atkriyā) mentioned in Hatha yoga. The last one out of the six s̟atkriyā is Kapālabhāti. Despite this, very often, popular literature incorrectly includes Kapālabhāti under prān̟āyāma. The word "Kapālabhāti" is made up of two words, where "kapāl" means skull (here, skull refers to all the organs under the skull as well) and "bhāti" means shining or illuminating. Due to the process, the organs under the skull, mainly the brain and the cerebellum, are influenced in a good manner. Hence, the word is used in that way. In the Gheran̟d Saṃhita, it is known as "Bhālabhāti." Bhāla and kapāla mean the cranium or forehead, and Bhāti is light or splendor (Saraswati, 1997). Kapālabhāti is a technique which invigorates the entire brain and the dormant centers that are responsible for subtle perception. It is also called the "frontal brain cleansing" technique. Practicing Kapālabhāti on a regular basis leads to shining face with inner radiance. Kapālabhāti is a highly energizing abdominal breathing exercise (Saraswati, 1996). The present research was designed to study the effect of Kapālabhāti practice on aggression in adolescents. In this scientific study, an attempt was made to reduce or manage the aggression level with the help of Kapālabhāti. Many researches have shown the positive effect of yogic practices on physical and mental well-being. But researches directly related to Kapālabhāti and aggression are not found or have not been attempted in the scientific world, or perhaps did not catch the attention of the researchers. Hypothesis: "Kapālabhāti does not have significant effect on the aggression level among adolescents." In the present study, the researcher used simple random sampling method to select participants from the population . A total of 40 intermediate and undergraduate students from Gayatri Vidyapeeth and Dev Sanskriti Vishwavidyalaya, Haridwar, Uttarakhand participated in the present research work. The age ranged between 15 and 20 years. 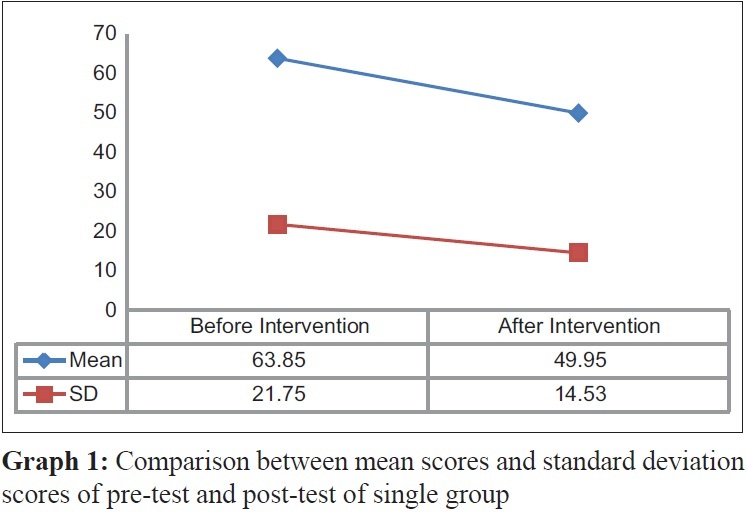 In order to study the impact of intervention on aggression, "single-group pre-post design" was applied. Pre- and post-test measurements on aggression were correspondingly conducted before and after the intervention. The above-mentioned design is symbolized as A Q1 X Q2, where A means the experimental group, Q1 represents pre-test, X means the intervention program (Kapālabhāti practice for 30 days), and Q2 represents post-test. In this research work, the researcher used the aggression scale questionnaire for measuring the aggression level, which was devoloped by Pal and Naqvi (1983). The split-half reliability and test-retest reliability of the scale are 0.82 and 0.78, respectively. Content validity of the test is 0.78. This scale is applicable for the age group 14-24 years. It has 30 questions to which the participants responded. All the items of aggression scale are related to behaviors in everyday life. There is no complexity in items. Each item has six alternative answers (multiple choice) graded on five point scale. A scoring pattern of 5, 4, 3, 2, 1, and 0 was followed and total score was obtained. The scores obtained from this scale vary between 0 and 150, and for interpretation of raw scores, the norms of this test are mentioned in the [Table 1]. Unstructured interview modality was used for discerning the subjective feelings of participants. Interview questions were framed under the domain of personal and social adjustment. Seven questions were asked to each and every participant. How much of the time, during last 2 weeks, have you felt calm and peaceful? Over the last 2 weeks have you been able to talk about your feelings openly with your friends? How much of the time, during last 2 weeks, did you feel relaxed and free from tension? Over the last 2 weeks have you got angry with any of your relatives? During last 2 weeks, how much of the time have you been bored about things? Over the last 2 weeks have you been offended or had your feelings hurt by your friends? Did you feel depressed during last 2 weeks? First, by using the aggression scale questionnaire, the aggression level of each subject was measured, and the group average was found to be 63.85. Post-test measurements of aggression level for the same subject were taken after following the practice of Kapālabhāti for 30 days. For the first 10 days, 20 rounds of Kapālabhāti practice were suggested for each subject in the morning. After 10 days, the practice rounds were increased to 30 rounds for 10 days and for the remaining 10 days, the subjects were asked to increase this practice to 60 rounds under expert supervision. One round comprises 10 natural inhalations and quick exhalations (rechaka). After this practice, they inhale and exhale deeply, for relaxation. All subjects took simple vegetarian food and lived in the same environment during the course of the experiment. For the rest of the day, they were busy in their daily routine and attended their classes. Instructions: "Sit with legs crossed in a lotus-like position or meditative posture, whichever you find convenient. Spine straight, chest open, start inhaling normally, and then exhale forcefully, so as to put pressure on the organs of the abdominal region. This makes one round. However, you have to visualize that while exhaling, you are throwing all the mental aberrations like anger, frustration, etc. out of your system, i.e. think that you are throwing negativity with air exhaled from your nose. You should try to see the color of negative elements coming out from your nose. It may be of black or red or any other color. With successive rounds, try to visualize that the color is being changed into white, which is the symbol of mental peace. In the beginning visualization may be difficult, but with practice it will be easy. So, do not worry about that. Do this technique efficiently. In the beginning, you may feel a little pain in the back or abdomen. But this will disappear after some practice. So, do not quit." A single-group paired sample t-test was conducted to evaluate the impact of intervention on students' scores on the aggression scale. [Table 2] and [Graph 1 [Additional file 1] ] shows that there was a statistically significant decrease in the aggression score from pre-test (M = 63.85, SD = 21.75) to post-test (M = 49.95, SD = 14.53), t (39) = 8.42, P < 0.01 (two-tailed). The mean decrease in aggression score was 13.9 with a 99% confidence interval. The eta-squared statistics was 0.64, which indicates large effect of the intervention on aggression. The guidelines proposed by Cohen (1988) for interpreting this value are: 0.01 = small effect, 0.06 = moderate effect, and 0.14 or more = large effect (Pallant, 2011). It is observed from the results that Kapālabhāti practice has reduced the aggression level in adolescents. Therefore, null hypothesis of the present research that "Kapālabhāti practice does not have significant effect on the aggression level among adolescents" is rejected. When the categories in [Table 1] are compared with the obtained results in [Table 2], we find that all the participants lie in the 'Average'category on aggression before intervention (M1 = 63.85) and the level of aggression of all the participants was decreased after completion of intervention course as they lie in the 'Low' category (M2 = 49.95 ). The term "aggression" is a mode of frustration (Chauhan & Tiwari, 1971). Frustration is the motivational and emotional state which results from persistent blockage of goal-directed behavior. It can lead to maladaptive behavior (Pal & Naqvi, 1983). The very famous hypothesis of "Frustration leads to Aggression" was formerly advanced by Dollard and Miller (1950), and they defined aggressive behavior as a logical and expected consequence of frustration. At present, most of the mental deviations such as frustration, aggression, inferiority, and insecurity have increased in adolescent and adulthood stages. Clinical studies carried out by Masteron, Tucker, and Berk (1963) have brought to light the disturbing fact that in the normal adolescent population, the mentally ill and the doubtful cases outnumber the mentally healthy adolescents. Interdisciplinary researches (Yoga and Psychology) suggest that regular practice of yoga promotes strength, endurance, and flexibility, cultivates a sense of calmness and well-being (Mehta, Mehta, & Mehta, 1995), and reduces the psychological stress significantly (Bhogal, 1997; Kocher, 1973; Kocher & Pratap, 1971). Sharma (2012) reported in her scientific research that Kapālabhāti prān̟āyāma reduces the mental aberrations like anger, frustration, self-ego attachment, and aggression. She studied the impact of different yogic practices like Kapālabhāti, Anuloma-viloma, and Om-chanting on aggression in adolescents. She selected 100 school students for the experiment and employed analysis of variance (ANOVA) of the order of 2 × 2 × 2 with repeated measure, and she concluded that Kapālabhāti with positive visualization is highly beneficial to the individual in overcoming the psychological problems. In the present research, Kapālabhāti was applied with a positive visualization like feeling of throwing out all the negative and injurious elements along with the air exhaled, and as a result, subjects reported that it was much more useful than what they expected. Kapālabhāti practice mainly affects our respiratory system which is responsible for our physical and psychological well-being. Physiologically, Kapālabhāti is the process through which all residual CO 2 is exhaled by the lungs and fresh air is inhaled by the subject. This inhaled fresh O 2 is very much beneficial for physical health (Gore, 2005). We know that hypothalamus (a main part of the brain) is responsible for emotional behavior, including aggressive behavior of the person. When sufficient amount of oxygen reaches the hypothalamus, it helps in the functioning of hypothalamus in a controlled manner. Another study by Van Lysbeth (1979) revealed that Kapālabhāti controls the circulation of blood within the brain. Kapālabhāti manipulates the volume of the total amount of blood in the body, the sum of the plasma volume and erythrocyte volume and the volume of blood in an individual's circulatory system. Blood volume can be calculated by determining the volumes of red blood cells and plasma cells. Females generally have less blood volume (3.8 L blood volume) whereas males have higher blood volume (5.3 L blood volume). Normal respiration consists of 12-18 breaths per minute, whereas Kapālabhāti can improve this up to 120 breaths per minute, which leads to a major increase in blood volume throughout, and thereby leads to better irrigation of the brain. In psychology, it is assumed that aggression is generally associated with frustration, fear, and a sense of inferiority. They are the main causes of an extreme form of aggression in the human behavior. In adolescents, frustration is found due to many reasons like academic anxiety, maladjustment in schools or peer groups, sexual conflicts, academic stress, etc. and ultimately frustration leads to aggressive behavior. Many researchers have proved that Kapālabhāti is a good yogic practice for reducing anxiety, frustration, etc. Kumari et al. (2005) found in their research that s̟atkriyā (Kapālabhāti) and prān̟āyāma significantly reduced academic frustration, conflict, academic anxiety, and total academic stress in senior secondary school students. Kapālabhāti has a positive effect on the emotional intelligence of adolescent students of class XII (Kumar et al., 2009). According to Bhandari and Kohli (2009), the practice of Kapālabhāti improves the logical memory of college girls. Participants were asked some questions on their feelings before and after the intervention, and they reported positive changes in their feelings. Before intervention, the participants felt tiredness, irritation, and maladjustment in family and friend circle. But after intervention, they were happy to convey that they were feeling energetic, cool, had a calm mind, and could adjust well with others. In this study, single-group pre-post design was applied. Lack of control group is the limitation of this research. The findings of the current study may have limited generalizability as the population of the current sample was limited to two institutions. To conclude, the present study shows that there is a significant positive effect of Kapālabhāti practice on aggression. The practice of Kapālabhāti significantly decreases the aggression level of adolescent students and keeps them away from tension, stress, and anxiety. The authors would like to thank all the participants of this study. A special note of thanks to Ms. Annie, Lecturer, Amity University Madhya Pradesh, for her kind assistance. Bhandari, R. & Kohli, G. (2009). Effect of suryabhedan prān̟āyāma & Kapālabhāti on logical memory of college girls. Yoga Mīmām̟sa, 41(3), 258-263. Bhogal, R.S. (1997). Yoga psychology- its relevance to stress, anxiety and emotional disorders. Yoga Mīmām̟sa, 32(4), 35-40. Chauhan, N.S. & Tiwari, G. P. (1972). Guide to Using Natrashya Maapa. Agra: Agra Psychological Research Cell. Collins, J. (1998). Yoga: Intuition, preventive medicine and treatment. Journal of Obstetrics, Gynaecology and Neonatal Nursing, 27(5), 563-568. Dollard, J., & Miller, N. E. (1950). Personality and psychotherapy: An analysis in terms of learning, thinking and culture. New York: McGraw-Hill. Gore, M. M. (2005). Kapālabhāti: A review of scientific and textual research. Yoga Mīmām̟sa, 36(5), 62-64. Kocher, H. C. & Pratap, V. (1971). Neurotic trend and yogic practices. Yoga Mīmām̟sa, 14(1&2), 34-40. Kocher, H .C. (1973). Introverted extroverted practitioners of yoga and their scores in neuroticism, anxiety and general hostility. Yoga Mīmām̟sa, 15(4), 69-74. Krishna Rao, P. V. (1995). Yoga: Its scientific and applied aspects. Journal of Indian Psychology, 13(2), 1-12. Kumar, A., Kumar, M. M. (2009). Effect of yogic exercise on academic stress of secondary level students. Yoga Mīmām̟sa, 41(2), 32-40. Kumari, S. (2005). Impact of yogic s̟atkriyās and prān̟āyāma on stress of senior secondary students. Yoga Mīmām̟sa, 36(5), 23-30. Masteron, J. F. Jr., Tucker, K. & Berk, G. (1963). Psychopathology in adolescents: Clinical and dynamic characteristics. Annual Journal Psychiatry, 357-366. Mehta, S., Mehta, M., & Mehta, S. (1995). Yoga the Iyengar way. New York: Alfred A. Knoff Company. Muktibodhananda (1998). Hath Yoga Pradipika (p. 220). Bihar: Yoga Publication Trust. Pal, R. & Naqvi, T. (1983). Manual of Aggression Scale (A-Scale). Agra: Agra Psychological Research Cell. Pallant, J. (2011). SPSS Survival Manual. (4th ed.). Australia: Allen & Unwin Company. Rana, M. (2007). Relationship of personality and family environment with aggression and the effect of intervention programme on aggression. (unpublished) PhD thesis. Department of Psychology. India: Himachal Pradesh University. Saraswati, N. (1997). Gheran̟d Sanhita (pp. 106-108). Bihar: Yoga Publication Trust. Saraswati, S. (1996). Asana, Prān̟āyāma, Mudrā, Bandha (pp. 417, 512, 516). Bihar: Yoga Publication Trust. Sharma, A. (2012). Monitoring Aggression in Adolescents: Yoga as a Panacea. Global Journal of Human Social Science, 12(15, 1.0), 32-46. Van Lysbeth, A. (1979). Prān̟āyāma: The Yoga of Breathng. (p.155). London: Union Paperback.